In the last two weeks I received three calls from West Bow Press. Not one call, not two calls, but three calls. You know sometimes God is just relentless!!! I worked on my book for a month or so and then put it aside. When I received the first call, I just blew it off. I did not even listen to the voice message. When I receved the second call, I thought, "Well that is just weird! Maybe I should talk to them if they call again." Well, you know what happened - they called again!!! I was driving home when the call came. I answered and she wanted to know how my book was coming!! Arrrrrrrrgh! What could I say? What book? She was so nice and even made excuses for me - Are you really busy right now? Don't really have time to work on it? But then it came - the big question. When do you think you will be ready to publish? Publish, are you kidding me? I cannot, or maybe should say, have not gotten the story down on paper. Oh, the pressure. She said, " 3 months, 6 months, a year?" I said, with great hesitation, "6 months or a year?" Why do I insist on doing this? Putting what God wants me to do aside for everything else? So, I went home and got out my spiral. The story really is good. The writing needs work. But maybe all I have to do is get it down on paper and then they will help me make it publishable. Praise God that He keeps pushing me when I am kicking and screaming and digging my heels in. Forgive me God for doubting you. That is really what I am doing. Doubting his ability to help me get the story written. "Screw praying, it doesn't do anything." These words showed up on Facebook a week or so ago. A young man frustrated with his circumstances. He had car trouble again. He had to walk again. It made me wonder about our view of God. Why do we think God will fix all of our problems just like that? He is not Santa Claus. He provides so many things - peace, strength, courage and yet we still look to Him to provide the magic answer the instant we demand it. My friend's father has leukemia. He is not old. He has been in treatment since May of this year. He had a bone marrow transplant last week. Praise God that a match was found. One of my daughter's friends just had surgery for a brain tumor. She is only a teenager. She is now going through radiation and then chemo. She will miss the rest of this school semester. Thank God they found the tumor. Thank God she came through the surgery so easily. My good friends lost their home in the Bastrop fire. They lost everything except a small suitcase of clothes, the wedding pictures and a few guns. Everything was gone. Thank God they had good insurance and will be able to rebuild. What about all of the other 1500 homes that were lost. Did they have insurance? My good friend lost her 11 year old son to cancer. Will her heart ever heal? Another friend lost her 19 year old son to a heart virus. Just like that he was gone. How does she go on knowing she will never see him again? A tragic car accident, just driving too fast. Five teenagers are involved. Two require major surgery. One girl dies. How does the family of the lost girl go on? How do they face each day? Life weighs us down. Life mashes us down. But our reward is in heaven. In Ecclesiastes 2:11 it says, "Yet when I surveyed all that my hands had done and what I had toiled to achieve, everything was meaningless, a chasing after the wind; nothing was gained under the sun." Our life here on earth is not meant to be heaven. We chase things that do not matter. We toil to achieve greatness. There are problems. There are deaths. There are illnesses that cannot be recovered from. And yet, God is there, available to hold us up as we meet each challenge. I want to be the type of person that recognizes God is not Santa Claus, but God does provide in big ways. I cannot imagine getting through my youth without God by my side. I cannot imagine getting through my miscarriages without God by my side. I cannot imagine raising teenagers without God by my side. Only He can hold me up when nothing else can. Have you ever seen something in nature and you just could not believe it? I think those are little miracles that God provides to remind us He is still there. Here are a few things I have seen that just amazed me. This is a volleyball in our pool. 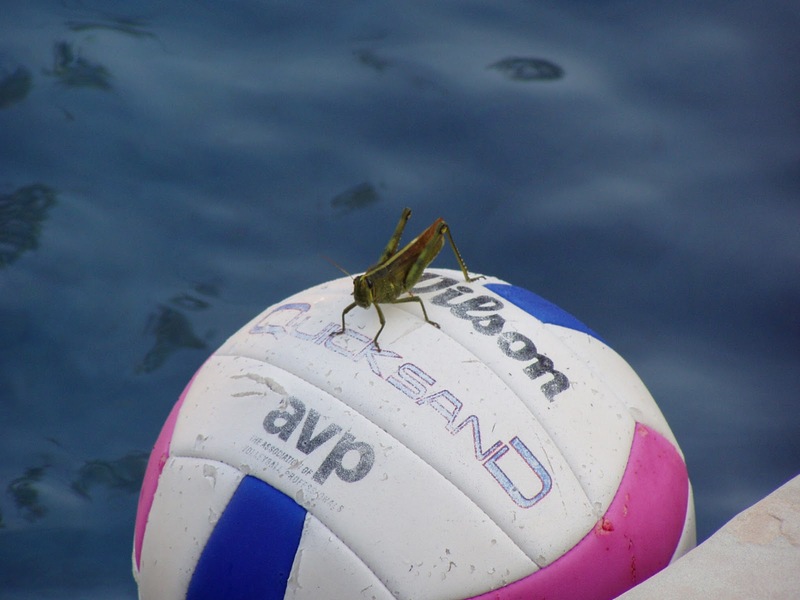 The grasshopper is resting on the volleyball. How cool is that? This reminded me that there are no coincidences. That grasshopper could have just as easily ended up in the pool. The pool is huge and can be dangerous, just like the world. The volleyball is tiny but powerful. God is like the volleyball - always floating nearby for us to grasp onto. Will we grasp for him or flounder in the deep waters? These are baby grasshoppers on the rock rose plant in my backyard. They were less than half an inch long. They were sitting enjoying the sun. They were so little and yet perfectly formed. I think they had just hatched and were drying in the sun? I loved that God created them and they knew just what to do. God's creations are perfect in whatever shape or form. This is the most amazing example of all. A week or so ago, my neighbor came over. He said, "I think you have a parakeet living in your attic vent!" Well a few days later, I heard a bird chirping and chattering. Sure enough, there was a blue parakeet sitting on our attic vent. Besides that, he has some little wild bird friends that hang out with him. I check on him every day. He sits in the tree and talks all day. He flies around but seems to "roost" in the attic vent. I added a bird feeder way up in the tree for him. I love to hear him chatter and get out the binoculars to try to see where he is sitting in the trees. I looked it up on the Internet because I was concerned about him surviving the winter. I am not sure what I would have done if he could not survive - Can you catch a parakeet?? Good news though. He can probably survive. There are parakeet "populations" all over. There is a large one in Brooklyn. There is even one in Austin! Keep your eyes open. What have you seen lately that was little reminder that God is out there? I am technically a middle-aged woman now. My hair has almost more gray than brown, and yet when I look in the mirror I still see an attractive person. About 12 years ago, I decided I would start dying my hair so that the gray would not show. I am a brunette and so I chose a shade of brown. The dye did strange things to my hair. All of a sudden I had a lot more red showing and a lot less brown. The gray was gone but in it's place reddish tones appeared. I was on a vacation in Utah when I saw my image and could not believe it. I was riding in the backseat of the truck and the sun was shining from the west. I glanced in the external mirror and saw a redhead. Oh weird. Oh my, that is me!! I came home and never dyed my hair again. There is a lot of comfort in having gray hair. It says, " I am proud of who I am". I have noticed so many Hollywood starlets changing their appearance to remain younger. My sisters laugh because I will say, "She did something to her face!" The telling sign is when your favorite star is on the front of a magazine and you have to do a double-take to recognize them. Oh, how we have let our insecurities drive us. Somewhere along the way we have accepted the fact that God's image is not good enough. We want to look better, look younger, look thinner, look taller. I wonder what God thinks about all of this? He designed us this way for a reason; to age at a certain rate, to get gray and wrinkled and slower in our pace. Maybe we should embrace our age. Love our gray hair. Brag about our laugh lines and crows feet. Be happy that we are not at the front of the pack anymore. I mean, haven't we earned it? We have lived full, productive lives; raising children, working, serving, providing, and giving. Can you imagine God being a young twenty-something? I think the image God gave me is good, really good. I want my insecurities to be less and God's image to be more.